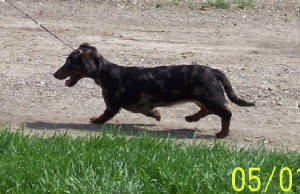 Take a few minutes to check out my female dachshunds. They have great pedigrees and will contribute much to my breeding program and in the showring. Anna Belle is a nice size of about 8 1/2#. Anna Belle has a good topline, good depth of chest, good front and rear angulation. She is a super sweet little girl. Anna Belle has an exceptional pedigree that will contribute much to our foundation stock. She also has many champions in her peidgree that come from the most well known bloodlines in the United States - Han-Jo and Pawprints to name a few. Anna Belle has offspring that are doing great from her 3 litters. I kept 3 of her puppies from her last litter that are doing great in UKC conformation. Thank you Cathy Jo Potter for letting Anna Belle come live with us. Dixie is a shaded red that weighs about 8#. She is very sweet tempered and loves to snuggle up with you on the couch or in a chair and stay for hours. She is low to ground, long in body and short on leg. She is well-balanced with bold and confident head carriage and intelligent, alert facial expression. 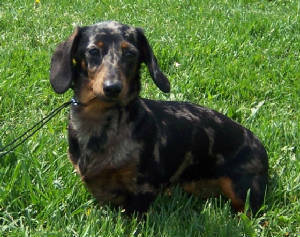 Dixie has many wonderful attributes and a very good pedigree that will contribute much to our breeding program. Thanks to Barbara Mason of Masondox for letting Dixie come live with us. This is my puppy I kept from my AnnaBelle/Patches breeding. Darla is a nice little girl that I have big hopes for. Darla has nice length of rib cage, nice short loin, a very nice topline, good balance, nice compact feet, nice length of neck and a beautiful head. Darla will hopefully contribute many nice attributes to my breeding program. NEWS FLASH!!! 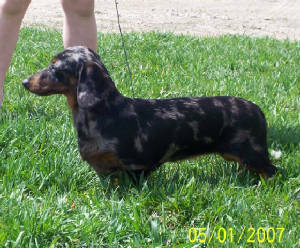 - Darla was in her first conformation show on 4/21 at a UKC show in Wapakoneta, Ohio. Darla took her class, Best Female of Variety, Best Female, & Best of Winners. Darla took the Breeder/Exhibitor class, Best Female of Variety, and Best Female in Wapkakoneta on 6-2 in the first show. In the 2nd show she took the Breeder/Exhibitor class, Reserve Best Female of Variety, and Reserve Female. NEWS FLASH!!!!! 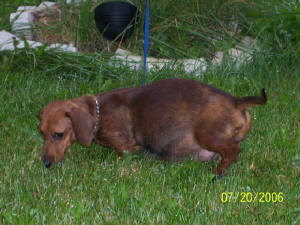 - Darla finished her UKC Championship on 6/30/07 at the show in Montpelier, Ohio. Rosie took her Puppy class, Reserve Best Female of Variety, and Reserve Best Female at Wapakoneta on 4-21. On 6-2, Rosie took her Puppy Class, Reserve Best Female of Variety, and Reserve Best Female at Wapakoneta in the 1st show. In the 2nd show, Rosie took her Puppy Class, Best Female of Variety, Best Female, Best of Winners, Best of Breed, and Group III. Check Available Puppies page for pictures.